↑ Kallenbach J.Z.In: Review of hemodialysis for nurses and dialysis personnel. 7th ed. St. Louis, Missouri:Elsevier Mosby; 2005. ↑ Seppa, Nathan (2 February 2011). "Bioengineering Better Blood Vessels". Science News. สืบค้นเมื่อ 4 February 2011. ↑ KDOQI Clinical Practice Guidelines for Hemodialysis Adequacy, 2006 Updates. CPR 5. ↑ Strain, Nick. 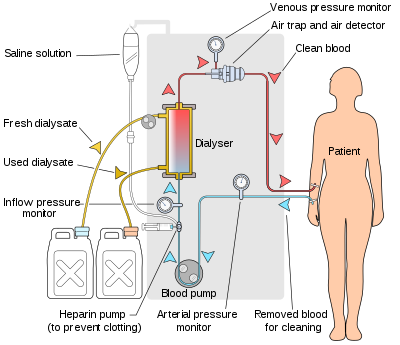 "Dialysis Tech". Dialysis Clinic. ↑ Canadian Association of Nephrology Nurses and Technologists. (2008). Canadian Association of Nephrology Nurses and Technologist Nephrology Nursing Standards and Practice Recommendations. Retrieved from http://www.cannt.ca/en//files/CANNT_Nursing_Standards_2008.pdf. หน้านี้แก้ไขล่าสุดเมื่อวันที่ 3 มิถุนายน 2558 เวลา 10:12 น.